Alabama's 4th Congressional District has been represented by Republican Robert Aderholt for some 22 years. The district is considered so hopelessly Republican that Aderholt ran unopposed in 2016 and 2014. James Lee Auman thinks that's a betrayal: "This is unacceptable. For any candidate to run unopposed is a degradation of democracy. No one fights for the right to fill in a box next to a stand-alone name on a ballot. If the voters do not have a choice then their voice is not heard and their right to vote is effectively nullified. In these instances, in the subtlest of ways, the voters are instead given an empty symbol of a right." 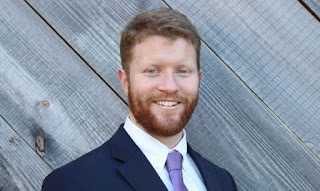 Auman is using Crowdpac to raise pledges of support to put his name on the ballot in the Alabama 4th District. "If we gain enough money and endorsements to mount a viable campaign, it will send a message that no candidate from any party can take their votes for granted. It will send a message that the people of this state and of this country are ready for a paradigm shift in political priorities. It will send a message that we are ready for a political philosophy that deems every person worthy of dignity and respect, that subverts the subtle systems of oppression which have kept silent the most vulnerable, and that strives to dissipate power and embolden service." Auman works for the Episcopal Diocese of Alabama at Camp McDowell in Nauvoo, the large Episcopal Church conference center and retreat, where he is in charge of guest services. "Auman's life has been inextricably affected by his involvement and leadership in the Episcopal Diocese of Alabama. He views this next chapter of his life as a mere continuation of his ministry to serve God's people, but he is uninterested in promulgating his own theological or religious views. Rather, Auman seeks to help others understand that we all walk abreast on the same journey and that we are all inherently deserving of the compassion of one another." We find Lee Auman an inspiring character and have pledged to support him. We hope to see more of this kind of political audaciousness in 2018 and especially hope to see it closer to Boone than Nauvoo, Alabama!